After a long month's baking, we're tackling one of my favorite pies today: Lemon Meringue. I learned how to bake this pie from my mother, who baked it frequently for my father--an ardent fan of lemon meringue. So much so in fact, that he jokes about ranking prospective brides based on their ability to execute the pie well. Unfortunately, my mother made something we Humbles call "Lemon Meringue Pool". Tasty but structurally… well, a disaster (sorry mom). When served, the filling would be slack and form a puddle on the plate. Hence the name. 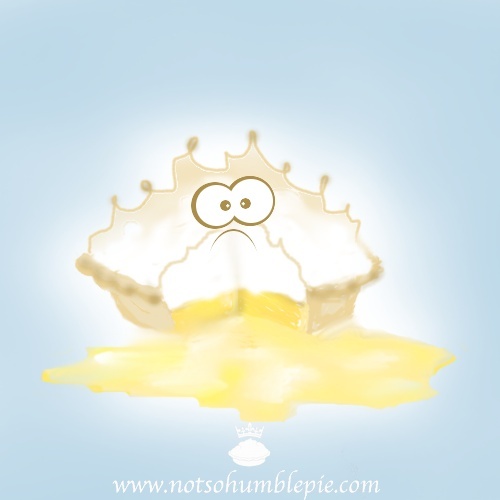 I'd post photos of lemon meringue pool, but to save mom face I'll post a quick doodle of a sad pie that appears to have wet himself. My dad married her anyway, so I'm assuming Mother Humble's other qualities were such that my father was willing to overlook this quite grievous flaw. Having learned how to make this pie at her side as a child, I inherited the recipe and its problems. As an adult I've had to endure the shame of delivering pies to my father with decidedly slumpy qualities. Luckily those days are over and I can produce pies with that perfect firm, silky filling that cuts beautifully yet melts in the mouth. The crowned lemon meringue pie was chosen as the NSHP blog mascot simply because I've probably obsessed over that pie more than any other dish in my repertoire--save for perhaps macarons, which is a more recent time sink. I know I'm not alone in my troubles with lemon meringue pie. I've seen plenty of soupy pies and botched meringues posted by their irritated and baffled bakers on my quest for the perfect pie recipe. It was only after dozens of recipes that I realized that I was approaching it all wrong. It wasn't necessarily the recipe that was dooming my pie filling to get a little slumpy, it was chemistry. You see, the elements that make up the filling for this pie don't really get along. They hate each other like those dysfunctional families on day-time talk shows, screeching and throwing chairs at each other. Let's talk about why they're so unhappy together. We rely on starch to thicken the lemon filling. After all, without it we'd be filling the pie with what is essentially lemon curd. Typically, you will see corn starch or wheat flour being called for as a thickener. (I prefer the former, since corn starch beats flour hands down in thickening ability, flavor, and texture.) Unfortunately, the lemon juice, the heat you're cooking over, the fat and even enzymes in raw eggs can all work against the thickening ability of starch. Let's start with the issue of acid. Mother Humble's problem was her love of extra tart lemon meringue pies (which I admit to sharing). She would make hers with a generous amount of lemon juice. Unfortunately, out comes the dysfunctional pie family dynamic and the lemon juice gets in a hair pulling match with the starch. The acid in the lemon limits the ability of starch to capture moisture, contributing to the sad pooling in the bottom of Mother Humble's pie tin. 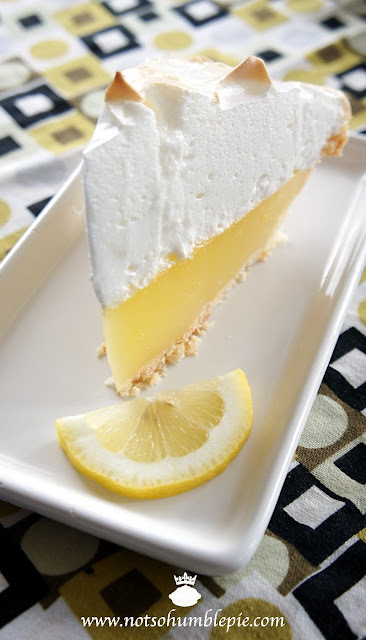 So when crafting and testing a lemon meringue pie recipe, we need to be sure we use enough juice to provide that bright lemon flavor, but not so much that our starch can't do its job. Using a bit less sugar is a better means of keeping things tart. This will also aid the thickening ability of the starch, since sugar too can inhibit the thickening ability of starches. When I began tackling this pie as a girl, I would try to solve the loose filling problem by cooking the mixture longer, figuring it would reduce the excess moisture content in the filling. This isn't an unusual approach, as many recipes call for extended cooking times. Even my copy of Martha's Pies & Tarts requires a relatively lengthy boil for her classic lemon meringue pie filling. Why would I question Martha, right? So I just continued to boil away. Little did I know, this isn't a good idea. I realized, once I had brushed up on a little chemistry (thank you Essentials of Food Science), that starch has limits when it comes to heat. What happens to starch granules as you heat them in liquid? When you heat a mixture of starch and water, water is able to enter the starch granules. These granules swell and reduces the free water in the mixture, components of the starch are then released into the mixture, changing the viscosity of the mixture and thickening it. Gravy 101 you're thinking, right? However, did you know that if your mixture gets and stays too hot, your starch granules can "implode" releasing their liquid back into the mixture and reducing the viscosity of your pie filling? Oh yea. During cooking, if you vigorously stir or whisk those hot bloated starch granules it can also cause them to burst. Continuing to stir after removed from heat is also ill advised. The amylose released from the starch granules will be doing the final job of setting the pie filling. To do this it is forming a fragile network structure between the granules to gel and trapping the remaining liquid. This isn't the most forgiving network and stirring the filling as it cools will destroy the nice firm silky texture we want. I'm trying to keep this reasonably simple. Still with me? Groovy. So now we all know that the acid and sugar, while delicious, need to be minded in relation to the starch. Fats too, to a certain extent, since we don't want to waterproof the starch granules (even if tossing a pat of butter into the mix does make the filling more luscious). We also know that we shouldn't subject the starch to searing heat or pummel our gelling mixture during the process with vigorous stirring or whisking. Got it? Alright, let's craft a pie recipe. The marvelously simple cooking/tempering technique I owe to the retired chef and author of Cookfoodgood.com. It works perfectly. In a medium heavy bottom sauce pan, combine all the ingredients for the filling with the exception of the boiling water. Whisk until starch has dissolved and the mixture is thoroughly combined. Whisk in the boiling water and then place the sauce pan over medium-high heat. Bring the mixture to a boil stirring gently with a silicone spatula or wooden spoon. Then reduce heat to medium-low and cook for up to one minute and no longer, continuing to stir gently. Immediately pour the filling into your prepared pie crust. If doing a hot filling meringue* immediately top with your pre-prepared meringue and bake according to the instructions below. If opting for a cold filling*, allow the filling to cool completely and then transfer to the refrigerator. Now, let's take a minute to talk meringue. I realize meringue can be a thorn in the side of many home bakers. Poorly made, it wrecks cakes, macarons, and soufflés before they even hit the ovens. Unfortunately, on pies like these, they can be even less cooperative. Barely cooked, the soft French meringues we typically slather lemon meringue pies with are pretty unstable. If poorly made, or just given enough time, the structure that makes up the meringue will break down and this will allow for the release of moisture and sugar. This is the weeping that smothers your pie with sticky ichor. It will happen to the best of us, hence the short shelf life (roughly one day) of French meringue topped pies. There are ways to minimize weeping, a few tricks and tips. And obviously, a well made meringue will hold up longer and weep less than a poorly made meringue, so execution is important. Unfortunately there isn't much consensus on HOW to make a meringue perfectly for a pie. 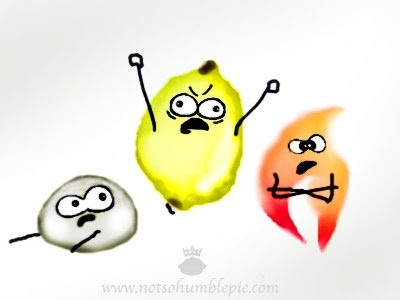 Specifically, I'm referring to the hot filling/cold filling lemon meringue pie debate. Some feel that a piping hot filling is the best method, as it provides heat to the bottom of the meringue while the heat from the oven cooks the top. This does make sense, since heat will help set the proteins and this buys you time when it comes to weeping. Still, by the time the pie fully cools, there is usually a little weeping to contend with. A sprinkling of cake crumbs between the filling and the meringue helps absorb this moisture. It does work and I do use this method. However with mile-high meringues, it can be difficult to ensure adequate heat throughout and by the time your filling cools enough to serve you may find yourself with a bit more moisture than desired. Others feel that the meringue is best put onto a chilled pie. Simply top the chilled pie with meringue right before serving, bake and then slice and serve at its structural zenith. Basically avoiding the whole weeping business all together. This is probably the easiest means of avoiding weeping for this particular pie. I will instruct you on how to do both, since I use both depending on my whims and when I am going to serve the pie. (I will note that the pie slice staged for most of this post was a meringue slathered on a cold filling.). However neither of these methods will save you from the headache of weeping if you attempt to store the pie for long periods or make the meringue poorly. Under beaten or over beaten/broken meringues cannot maintain their structure or hold onto their moisture. Before I get to that though, I will mention there is also the option of using a cooked syrup meringue like Italian, which will hold up better (and longer) with minimal weeping but one exchanges the lightness of the French meringue for a more marshmallow-like meringue. The heat from the boiling hot sugar syrup in the Italian style meringue will cook and set the egg proteins, resulting in a much more stabile pie topping. Stable, but incredibly sweet as it usually requires twice the sugar. I prefer the etherial quality of French meringue on top of my pies and am willing to deal with the limitations that come with it. Let's get down to making a French meringue for this pie. I always use a cornstarch infused meringue. It seems sturdier, less prone to weeping and comes with the added bonus of a silky mouth feel and cleaner cuts. I also employ cake crumbs here (usually from a plain, unglazed cake donut) to catching any rogue moisture ensure a dry seal between my pie filling and meringue. This, in addition to 'sealing' the meringue to the crust before baking helps prevent the meringue from slipping off the top of the pie when serving. Combine the cornstarch and water and then place over medium high heat stirring constantly until it has thickened into a gel (about two minutes) and set aside. In a large bowl, lightly beat the egg whites and cream of tartar to dissolve. Begin beating on medium-low speed until foamy and begin slowly sprinkling the sugar in while beating, giving the sugar time to dissolve (this is very important). Continue to beat on medium speed until stiff glossy peaks form. Then add the corn starch gel and beat to combine. Sprinkle either your chilled or freshly poured piping hot pie with crumbs (if using) and then apply a large dollop of meringue. Spread the meringue to the edges of the pie, taking care not to disturb the crumbs. Seal the pie completely by pressing the meringue against the crust. Add the remaining meringue and fluff (or smooth) with a spatula in such a way that pleases your own personal aesthetics. Bake the pie for 12-15 minutes until golden brown. Do not over cook as this will cause beading on the top of your pie. For the chilled filling pie, allow the pie to stand for 15 minutes before cutting (using a clean damp knife) and serving. For the hot filling method, place the pie on a wire rack and allow to cool to room temperature before serving. Okay, so maybe not my magnum opus (just really long), but not bad for a woman waddling about her kitchen in her 9th month of pregnancy. We only have one more week until the arrival of the littlest Humble! yum, my hubs fav too, but have never been able to do this, so now will try, thanks for the tut, it explains a lot of the not so good pies! Happy delivery! Will bake in your honor to celebrate. Yum, lemon. Oooo...This looks fantastic, Ms. H. Could this be made in a 12x24x2 rectangular pans? I would need to multiply your recipe times 3 for each pan. Would love to try this on my church family. I've doubled the recipe several times with absolutely no problems, so it should be fine made in a triple batch size. As for the pans, I don't foresee any trouble. The filling is sturdy and even cut into bars, it should be nice and tidy. Love the shot of the sun through the lemon part of the pie. Gorgeous post, very informative. Gorgeous pie! I love how you combined adorable cartoons and real science to explain how to make the perfect pie! this is truly informative! alleviated a lot of fears with making lemon meringue pie, thanks! Wow this looks so amazing I will definitely have to try it. Thank you! beauuuuutiful! looks delicious! had to laugh at your doodles too. looks so good...one of my favorites !!! I'm in food science heaven! Look forward to trying it. Here's wishing you, your family and the New Arrival well! So, so gorgeous. Seriously. I love recipes that have been reworked and tinkered with over the years, especially when they come as part of an epic quest to find the perfect version of something like pie. Beautiful! I can't wait to try this! I loved that you included the how and the why of the ingredients interaction with each other. Thanks so much! Lemon Meringue pie was always what I asked for for my birthday. No cake, no way. Lovely post, and can I say, as someone currently three weeks away from ye old due date, your fortitude astounds me. Good luck when the new baby arrives! wishing you a wonderful delivery & wishing all well! What an incredible post! I love you for doing stuff like this. Lemon meringue pie is my Grandpa's favorite, but - much like you - I've never been thrilled with how mine turn out. Thanks for sharing all of your work with us. I can't wait to give your recipe a go! 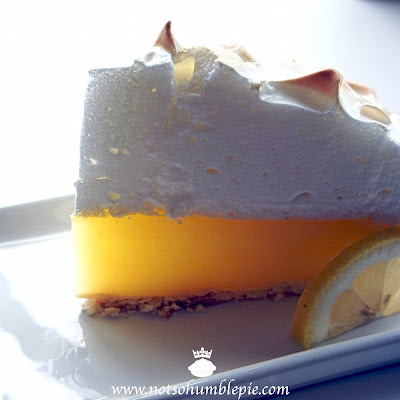 I love meringue,I love lemon, I love pies.....I love everythinh about this recipe!!!! It looks fab!!!!!! your pie looks amazing! !I will have to try it! Looks amazing! I love making pies and I will have to try this - i have not has as much success with lemon meringue so this sounds great. Check out the giveaway on my blog going on now! Wow, this stuff is VERY thick! I couldn't even cook it to boiling before it thickened so much I couldn't continue stirring! Most recipes have up to 1/4 cup cornstarch - is that 1/2 cup correct? I need to make this - it looks so delicious!! Thanks so much for sharing!! I love your blog and I am your newest follower!! Out of curiosity, what does the textbook say about potato starch versus corn starch as the thickener? Can't potato starch withstand high heat and maybe therefore absorb more moisture at longer cooking times? Actually, I only have potato starch on-hand and may try this recipe with it to see what happens. If I remember correctly, potato starch doesn't thicken as effectively (gram for gram) vs corn starch (corn flour) at these (or higher) temperatures. I love your blog! I made this recipe (the lemon filling turned out AMAZING! ), but I had a hard time incorporating the gelled corn starch into the egg white whip; it was a bit chunky. Any suggestions? The cornstarch paste should be smooth and mix easily into the meringue. If it is giving you any trouble just omit it and make the topping like a standard french meringue. It provides a nice mouthfeel and helps a bit with the moisture but it isn't absolutely necessary to make a successful pie. If the meringue itself is chunky, well then that is another issue. Meringues that appear seedy, or to have small curd-ish looking lumps are usually broken. In which case one just needs to be mindful of the beating speed and time to ensure one does not over beat the egg whites. Found this recipe on Pinterest and was excited to try it over the weekend. I was able to really impress the inlaws with pie and coffee this past Sunday. This was by far the best pie that has come out of my kitchen. I also had a little bit of an issue with the cornstarch in the meringue. The first time I left it on the heat for too long and it turned into a really thick glob that didn't mix in well. The second time left in on the heat for a few seconds and took it off immediately. Second time worked much better. I'm sure after doing this a few times it will keep getting better. Thank you so much for this recipe. Everyone loved it! Just curious and maybe this is a stupid question, but what is the difference between the hot filling and the cooled filling? To make the pie do you do something different to make it one way or the other? You can make it one way or another. Lots of people will argue that one is better than the other for this pie but really, it is just a personal preference. For myself, I like to let the filling cool and top it with meringue within a couple hours of serving.